Smetana’s set of six tone poems, gathered together under the collective title Má Vlast, occupies a particular place in the pantheon of Czech music. 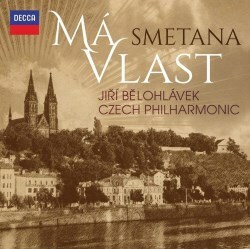 As such, they are frequently heard during the Prague Spring Festival and it was at the 2014 Festival that Jiří Bělohlávek and the Czech Philharmonic Orchestra gave a pair of performances which resulted in this CD release. Bělohlávek had returned in 2012 for a second spell as the orchestra’s Chief Conductor – he remained in the post until his death in May 2017 - and these performances of Má Vlast represented their first appearance at the Festival since his return to the orchestra. At the start of Vyšehrad the solo harp is very prominently recorded – as is the case in a version conducted by Jakub Hrůša which I reviewed last year. Thereafter, I thought this Bělohlávek performance contained much to admire. The music is presented freshly and the Czech Philharmonic’s playing is excellent. I especially liked the delivery of the subdued passages towards the end. In Vltava the river bubbles up attractively from its source and thereafter flows nicely through the Bohemian landscape. Bělohlávek paces the music intelligently: the speed is fairly swift but not excessively so. As the river wends its way past the wedding celebrations the dancers have a nice spring in their step. Best of all, the tranquil episode (5:30-7:44) is beautifully done with the CPO’s violins singing most poetically – and here the harp is properly balanced. All that said, other versions that I’ve heard have excited me more. I’m afraid I found Šárka something of a disappointment. This music depicts a legendary warrior princess who exacts revenge on her unfaithful over. To be truthful, Smetana’s music isn’t perhaps the most graphic illustration of such a tale but, frankly, the present performance is a bit bland. I’ve listened to it a few times now and it doesn’t do much for me. Z českých luhů a hájů (From Bohemia’s woods and fields) fares rather better. Bělohlávek’s affectionate view of Bohemian rural life is splendidly played by the CPO and I liked the energy with which the polka episode is invested. The first four minutes or so of Tábor are done well; a good feeling of legendary mystery is established. candidly, though, that’s the best passage in what I’ve always regarded as a somewhat weak piece. I completely get that Smetana was seeking to evoke national pride in this music but the result seems a bit obvious to me. Bělohlávek and the orchestra play the piece with conviction but Smetana’s music doesn’t really stir me: I got rather more out of it in the Hrůša performance. Blanik goes well under Bělohlávek. Here I especially admired the performance of the pensive section between 2:15 and 4:28, which is distinguished by excellent woodwind playing, not least from the principal oboe. At the end Bělohlávek brings the piece, and the cycle, home in an exuberant fashion. When I look back at my review of the Jakub Hrůša recording, I see that I found rather more to say about each of the six symphonic poems than is the case with this Bělohlávek traversal. I think that’s instructive. The Hrůša reading is much more interesting – though I readily acknowledge that some listeners may find it is not to their taste, especially in the matter of some expansive tempi. By contrast, Bělohlávek is more mainstream and much less individual. Furthermore, while Tudor’s sound for Hrůša is vivid the Decca recording presents Bělohlávek’s performance in sound that is good but certainly not outstanding. A note in the booklet, jointly authored by the two top executives of the Czech Philharmonic pays tribute to Jiří Bělohlávek, so I presume this release is offered in his memory. I admired much of this conductor’s work, not least with the BBC Symphony Orchestra, and so I’m sorry that I can’t give an unqualified welcome to this account of Má Vast. There’s a good deal to enjoy in the performance but it doesn’t surpass either the very individual Hrůša performance or Rafael Kubelik’s memorable live 1990 recording with the Czech Philharmonic (review). For me, Jiří Bělohlávek’s memory is far better served by his eloquent 2016 recording, also on Decca, of Dvořák’s Stabat Mater (483 1510).